IMS Ghaziabad (University Courses Campus) is a 28 year old institute of IMS Ghaziabad Group of Institutions Ranked 3rd in Northern India/Delhi NCR among Private Institution as per Times B School Survey, June 2017. IMS Ghaziabad has also been ranked as 1st UP & 16th in India by MBA Universe Ranking 2013. 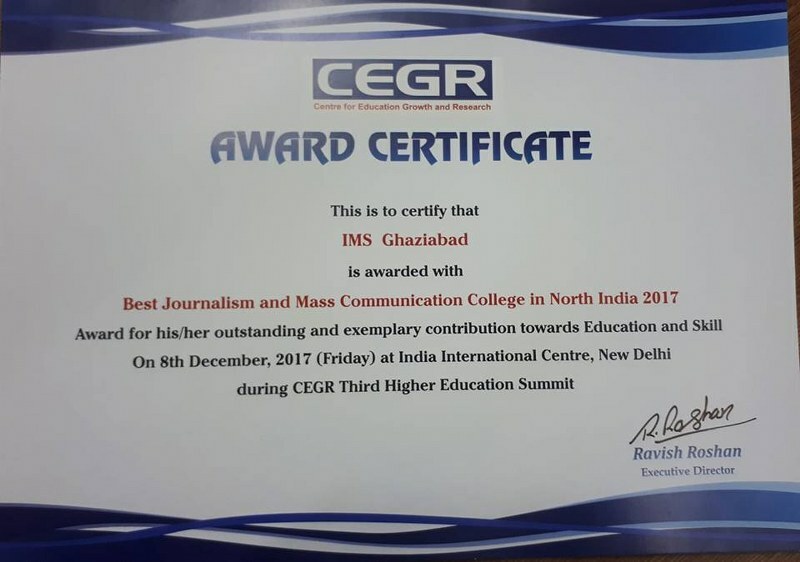 IMS Ghaziabad (University Courses Campus) is undoubtedly the best BBA college in Delhi NCR and ranked as the Topmost college in Delhi NCR for BJMC (Journalism), BCA, BSc (Hons.) Biotechnology and Microbiology and also MSc in Biotechnology. Students of IMS Ghaziabad are exposed to the real world experience through internships in the most esteemed institutions in the world like National Geographic, Amazon. Students are sent for internships in Dubai with esteemed companies under the Student Exchange Program. These students also get high package placements in multi-national companies (MNC) like Wipro, Amazon, CapGemini and so many more. IMS Ghaziabad was founded in 1990 by a group of visionaries and intellectuals to impart quality education in a stimulating and innovative environment where students are empowered with knowledge and professional skills while upholding the values of integrity, tolerance and mutual respect. A Learning Resource Centre . On Campus Job for our young earners ! Learn Digital ! Learn Smart ! that takes you places ! "SWADESHI STARTUP NATIONAL CONVENTION at IIT DELHI"
"Youth leadership campaign - Bright Spark"
"MIB Students placed in YES Bank"
"BCA students Placed in WIPRO"
Guest Lecture on "21st Century Skills and Challenges "